Picture: Dr. Wolfgang Adlwarth from GfK presented current market data. In all probability 2015 will be the year when the natural cosmetics sector will again experience double-digit growth in turnover. 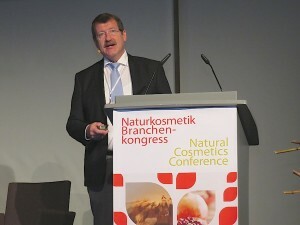 At the 8th Natural&Organic Cosmetics Conference on 6 and 7 October in Berlin the approximately 220 participants were brought up to date on current developments, figures and trends in the industry. The market analysis carried out by GfK reveals that customer reach and the repeat purchase rate have risen continually in the past five years. Intensification of demand is the main driver of market growth. In 2014, around 13 percent of German consumers met all their needs for cosmetics and toiletries with the purchase of natural cosmetics products. For the first time Danila Brunner (picture on left), the new executive in charge of Biofach and Vivaness at NürnbergMesse, together with Elfriede Dambacher, welcomed the attendees in the Ellington Hotel Berlin. Danila Brunner said how very pleased she was to be working for an industry that lived values. For the upcoming Vivaness she announced there would be a number of innovations that would help to make the Trade Fair for Natural Cosmetics even more attractive and lively. At the start of the Natural&Organic Cosmetics Conference, programme director Elfriede Dambacher (picture on right) explained to the international guests that the natural&organic cosmetics market is shifting increasingly from its traditional avant-garde position in the direction of the mainstream. There has been no slow-down in customers demanding authentic natural cosmetics, and that’s worldwide. She said that further drivers are the worry about dangerous ingredients and the desire to have a positive influence on our world as it becomes increasingly complex. The market is undergoing rapid change: “Change is always followed by challenges,” maintained Dambacher. Despite positive development Dambacher identified an issue that needed to be addressed by both the manufacturers and the trade. She said that the brand manufacturers neither differentiate their products sufficiently from traditional cosmetics nor have groundbreaking innovations. She found there was a lack of advice at the point of sale to satisfy the higher expectations of customers and to meet the requirements of the many enquiring and interested customers who already have considerable knowledge of the subject. In her introductory address, she identified further shortcomings and thought manufacturers and the trade should be more creative, have greater flexibility and be able to identify more with the requirements of the market. The ongoing growth in the current year is highly likely to result once again in double-digit growth between 10 and 11 %. In the first half of 2015 the industry recorded growth of around 8 %, with growth in drugstores, conventional retail and online shopping coming to 15 %. The figure for department stores was 13 %. Although it started from a low base, growth of 47 % in the perfumery sales channel is especially eye-catching. This sales channel now has a 6 % market share. The market share of private labels is now 27 % (turnover) and has, according to GfK analyst Adlwarth, declined slightly. In total, the turnover of natural&organic cosmetics market came to 1.009 billion euros in 2014. 13 percent of German consumers were already covering their need for cosmetics and toiletries with the purchase of natural&organic cosmetics. 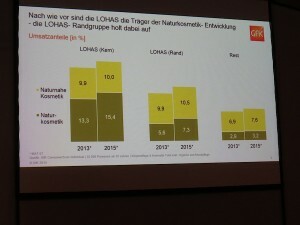 Picture: The GfK statistics illustrate the fact that the marginal Lohas groups (on right) are increasingly buying natural cosmetics (olive green). Dr. Wolfgang Adlwarth analysed market development and addressed various issues in detail. For example, in the five years from 2011 to 2015 it is clear that average growth of around 4 % a year applies to both customer reach (currently 22.6 %) and to the repeat purchase rate (56.1 %). According to Adlwarth, this confirmed the great current and future potential of natural cosmetics. “Heavy users, who continue to be recruited predominantly from the Lohas group, are constantly increasing their demand and covering their needs with natural cosmetics. In particular, the marginal Lohas group is catching up and joining the core group.” The facts pointed for Adlwarth to a high level of satisfaction and the consequent loyalty of customers. He called natural&organic cosmetics the “driver of growth of the macro-market”. 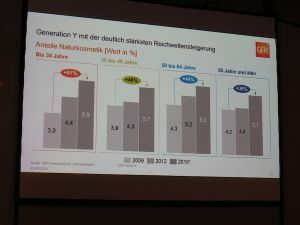 Picture: The GfK evaluation of the buying behaviour of generation Y shows that they have made a major contribution to the growth in sales of natural&organic cosmetics. Adlwarth examined the growing online trade in particular. 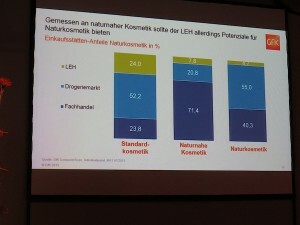 Although he referred to this sales channel, that currently accounts for about 3 % of natural&organic cosmetics sales, as a “still tender plant“, the share of online turnover in terms of value, as ascertained by GfK ConsumerScan, is 4.4 % and exactly the same as for conventional cosmetics and toiletries. In the case of natural&organic cosmetics, 51 % of customers covering their needs is a very high figure (conventional cosmetics: 28 %). This means that natural&organic cosmetics are in third place in online trade behind pet supplies and non-prescription medicines. Adlwarth and other speakers emphasised that the internet is becoming increasingly important not only as a sales channel but especially as an information channel as well. The younger generation in particular uses websites, the social media, consumer forums and search engines to access information about products. Retailer and brand websites are especially popular sources of information. With the help of statistical evaluation, Adlwarth demonstrated that the so-called generation Y of 19 to 34 year olds in particular has raised the turnover of natural&organic cosmetics in the last five years. With the reach rising by almost 90 %, it exceeded all other age groups and now stands at around 6%. Adlwarth referred to the so-called “responsible stagers”, who constitute 29 % of the young target group up to the age of 39 and generate 51 % of expenditure on natural cosmetics in this age group, as ambassadors and trendsetters. More about the themes examined and discussed at the Natural Cosmetics Conference can be accessed in further articles at Organic-Market.Info.